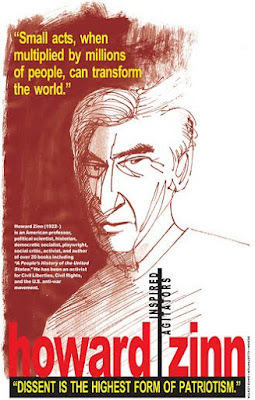 I illustrated and designed this poster of Howard Zinn after seeing him on a television program in 2009, where he enthusiastically expressed the idea that progressive social change could be achieved through small groupings of people working together rather than change always being based on a mass centralized group. It felt refreshing to hear in a time when the weight of it all can be depleting and hopeless. That we can all make social change seems to me to be a vital political message. As part of this process I've been designing an ongoing poster series called "Inspired Agitators" that highlights the work of activists like Howard Zinn. As well, I perform in the underground rock duo Mecca Normal (with Jean Smith) where we show the "Inspired Agitators" series as part of a lecture/presentation called "How Art & Music Can Change The World". CSPG depends upon the donation of posters and prints to make this resource as representative as possible of the many historical and ongoing struggles. CSPG collects graphics with overt political content that were produced in multiples—including offset, silkscreen, stencil, digital output, woodcut, linocut, etc. Old and contemporary posters, as well as duplicate posters, are welcome. FACTS to Honor CSPG! Call for Posters!